Walk among flowers, trees and interesting plants in the winter? Yes if the garden has been transformed with lights. From the Chicago Botanic Garden and Morton Arboretum in the Chicago area to Bellingrath Gardens and Home near Mobile, AL and the Desert Botanical Garden in Phoenix, several gardens across the United States are putting on their holiday evening finery with lights and sounds to say enjoy the season no matter what the temps. Whether you take a a “staycation” or go out of town, there’s likely to be a garden near by dressed up for the holidays. 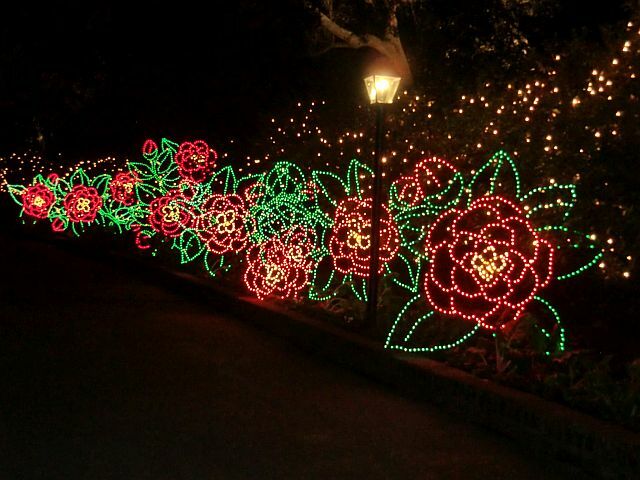 If near Mobile, AL do get tickets to explore Bellingrath Gardens and Home. The 65-acre estate of Walter and Bessie Bellingrath treats visitors to breathtaking light displays and the home is decorated for the holidays. Called Magic Christmas in Lights, and running Nov. 24 through Dec. 31, 2017, the holiday event has about 15 scenes, 1,100 displays and three million lights to surprise visitors around every corner and off in the distance.. Weekends feature choral groups on the home’s South Terrace. Bellingrath Gardens and Home is at 12401 Bellingrath Gardens Rd., Theodore, AL. For tickets, hours and more information call 800) 247 8420 and visit Bellingrath Magic. In the Chicago area trees sparkle with thousands of lights outside and trains toot around city landmarks inside during the Chicago Botanic Garden’s Wonderland Express celebration, Nov. 24, 2017 through Jan. 7, 2018. BTW there is gently falling snow in the main train area and poinsettias in the greenhouses. The Chicago Botanic Garden is at 1000 Lake Cook Rd, Glencoe. For tickets and other information call (847) 835-5440 and visit Chicago Botanic Wonderland. 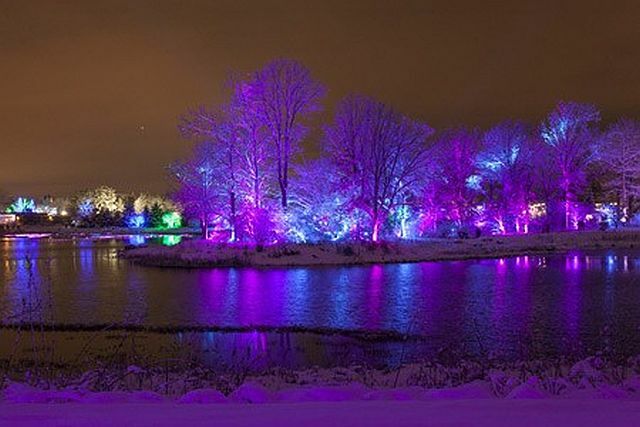 Also, go over to the Morton Arboretum where colored lights spectacularly light up the grounds during Illumination Nov. 17, 2017 through Jan. 1, 2018. The lights are interactive with some lights moving to music and some trees changing color with a hug or song. A medallion will also be sold that reacts to the sights and sounds. The Morton Arboretum is at 4100 IL Hwy, 53, Lisle. 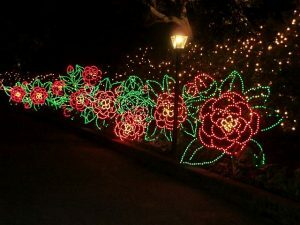 For tickets and other information call (630) 968-0074 and visit Morton Arb Illumination. Tip: Tickets to the Botanic Garden and Morton Arboretum holiday shows need to be bought in advance because they are time and date specific and sell-out early. If vacationing in the Scottsdale/Phoenix area go over to the Desert Botanical Garden for Las Noches de las Luminarias, Nov. 24 through Dec. 30, 2017. Wander the paths lit by thousands of luminaria bags and twinkling lights. In addition the garden will be featuring the work of Japanese American sculptor Jun Kaneko. The Desert Botanical Garden is at 1201 N. Galvin Parkway, Phoenix, AZ. For tickets and other information call 480-941-1225 and visit DBG Luminarias. Next in the holiday series will be zoo lights but if you have a favorite holiday garden visit not mentioned here please tell us in Leave a Reply.